The Kentucky Derby is as close to a bourbon holiday as we have in America. So if you’re thinking of running to the liquor store to pick up some bourbon for the Run for the Roses, here are five best-buy bourbons, plus some honorable mentions worth consideration. 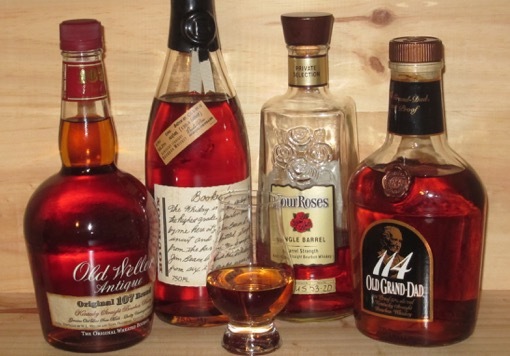 So without further ado, here are five best buy bourbons that provide good bang for the buck. Old Grand Dad 114 – Costing barely more than $20, this is a connoisseur’s bourbon at nearly bottom-shelf prices. It features intense flavors, high proof, complex wood, and sweetness. (FYI: Old Grand Dad 114 is essentially a less diluted version of the 80-proof Basil Hayden, which sells for double). My only hesitation with putting it on this list is that sooner or later enough people will discover what a gem this OGD114 is and it will become overly difficult to find. Weller 107 – Two or three years ago, Weller 12 ($30) would take this spot, but now people are buying every bottle they come across at retail price. This 107-proof “Weller Antique” is itself quickly becoming a little harder to find, but at $25-30 it remains a quality example of the slightly sweeter stye of wheated bourbon that makes people drool when it’s in a bottle with the words Van Winkle on it. Buffalo Trace – It’s not a small batch or single barrel, nor does it carry an age statement guaranteeing a certain number of years in the barrel, but the eponymous bourbon of the famed Buffalo Trace Distillery delivers the goods. Vanilla, toffee, wood, and fruit make it pleasant neat, and the price ($25) makes it easy to pour into a cocktail. Booker’s – I’ve noted before that Booker’s ($50-60) is a bit underrated, and I stand by it. Brash vanilla and wood mean it isn’t for beginners, but it is dangerously tasty and, best of all, available at almost every decent liquor store or bar with more than a handful of bourbon offerings. Four Roses Private Barrel Selection – The entire Four Roses line is excellent (even the standard Yellow Label) but the Private Barrel Selections ($50-70) are truly world class. Because each barrel is a store pick, this is a bit tougher to find, but fortunately it isn’t impossible yet. Each of Four Roses’ ten recipes takes on its own character, but none that I’ve come across have disappointed. Honorable Mentions: Old Forester, Very Old Barton, Jim Beam Black 8 Year, Bulleit, Eagle Rare 10 Year, Blanton’s. For more excellent bourbons, see my lists of Five Good Bourbons Under $30 and Five Good Value Bourbons Under $20. OGD 114 is so good for the price… 100% agree. I always laugh at people who but Basel Hayden especially since they dropped the age statement. They are literally paying 20 bucks for Beam to water down OGD and put it in a fancy bottle.